Kaitlin is using Smore newsletters to spread the word online. 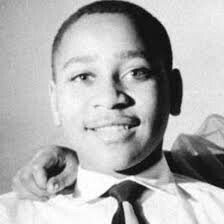 Emmett Till was born on July 25 1941 Chicago,IL He died on August 28 1955. Emmett Till went to school at McCosh Grammar School. Emmett was visiting family on August 24,1955. He told some of his friends he had a white a girlfriend back in Chicago so his friend told hime to go ask a white woman out. So he went to go in the candy store and as he walked out he said Bye Baby. The woman was the cashier she had a husband named Roy Bryant. Four days later the woman told her husband that a Boy whistled at me so Roy Bryant and his half brother J.W. Milam went to Emmett's Uncles house to get Emmett. They forced him to go into the car and they told him to carry the 75 pounds of cotton the bank after that they beat him and his eye bulged out and they shot him in the head and threw him in the Tallahatchi river with Barbed wire straped to his neck. Three days later his body was found and his mom requested a open casket so the world can see what they have done. They went to court and the judge found Roy Bryant and J.W. Milam not guilty because they couldn't identify the body. And that is what changed the way of civil rights.